We've had a few frosts during the last week. 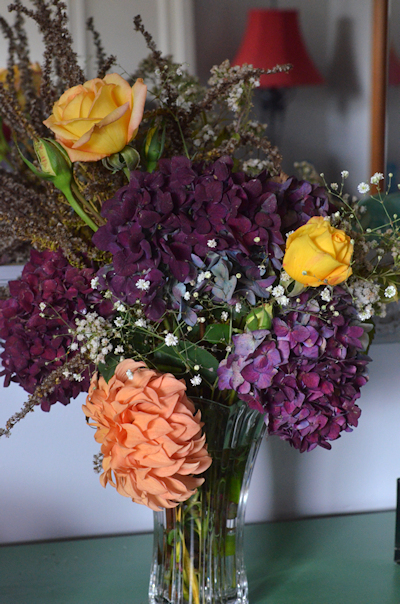 There were still lots of blooms left in the garden so I cut a few of them before the cold snap. The rose 'Gold Medal', one of our favorite hybrid teas, is sending up 6 feet stalks that we see outside the bathroom window. The hydrangeas are still covered with dramatic, dark purple balls of color. I don't have many dahlias in the garden and I don't recall where the orange one came from but it is very pretty. Dahlias are to be dug up after the first frost so that is a chore I must do this week. There is another pretty pom-pom dahlia called 'Lolipop' in the front garden that I purchased at a Master Gardener plant sale shortly after we moved. I have been very pleased with Baby's Breath (Gypsophila) although it has gotten much bigger than expected. It is too tall for the front of the border it resides in and I would like to transplant it before spring. And in the rear is the remnants of Goldenrod, a good filler flower for an arrangement but so, so messy. Such a striking combination of blooms. Those golden roses really pop in that color wave. Happy IAVOM. Nice combination! What makes goldenrod so messy -- just in a vase or in general? The dried blooms are very tiny and fall everywhere when disturbed. Ohmygosh the color of those hydrangea!!!!!!!!!!!!!!!!!!!! Beautiful! The color of hydrangea is so stunning!